Ask anyone who plays a ukulele to give you a rundown of the best ukulele brands and Kala is sure to be on the list. It’s hard to talk about ukuleles and not mention Kala Brand Music Co. They’ve become synonymous with quality ukuleles and they’ve earned many fans since they started building instruments in 2005. Kala is based in the town of Petaluma, CA, just 30 miles north of San Francisco, and their instruments delight uke players all around the world. Kala offers a diverse range of products. Their ukuleles can run from great beginner ﻿ukuleles to top end pro models costing thousands. Both beginners and experts will be able to find a Kala to suit their needs. But what is the best Kala ukulele? Given the endless care and love that Kala showers on its instruments, it’s really hard to tell. Personal preference will always rule. For the sake of those who have yet to experience playing a Kala, we’ve compiled this rundown of our favorites. The Kala KA-C Satin Mahogany concert ukulele is a great ukulele for beginners. This is not the first time I’ve done a Kala KA-C review and I don’t think this will be the last. But that’s mostly because I can’t imagine writing a Kala ukulele review article without mentioning the KA-C. This is a quality, affordable ukulele that’s perfect for those just starting out. The in-between size of a concert ukulele makes it easy for people with small and large hands to form chords and pluck the strings. The KA-C is also elegant and classy. It has a beautiful mahogany body, and it’s decorated with a simple white binding. It features chrome die-cast tuners that make tuning a breeze. The KA-C offers a full sound that you will definitely grow addicted to. Want the same great quality and sound in a soprano ukulele? Check out the Kala KA-S. The Kala KA-ATP-CTG Acacia Cedar tenor ukulele is a wonderful-sounding instrument that features a unique combination of tonewoods. This uke has a lovely cedar top, and the sides are made from acacia, a cousin of the Hawaiian Koa that has remarkably decorative dark and light brown stripes. It also features Padauk rosette and binding, and a rosewood fingerboard and bridge. The Kala Acacia Cedar Tenor has an incredible sound, with great volume and a beautifully rich and colorful tone. It’s warm but it also packs a punch. The intonation is perfect up and down the neck. Overall this uke looks great and sounds great too. We can’t talk about Kala ukuleles and not mention the fantastic Makala line. 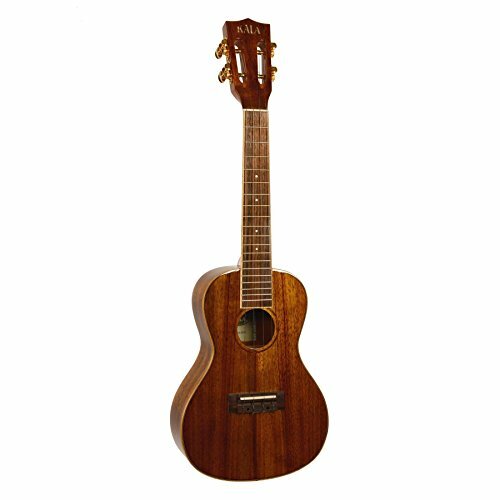 Kala’s move to create a range of affordable ukuleles culminated in the budget-friendly Makala ukuleles. Much like the KA-C, we’ve written Makala ukulele reviews before, and I’m sure this won’t be the last time. Despite the lower price, this is a quality ukulele that is a great choice for any budding player. Setting aside the fancy frills and decorative features, the Makala MK-S soprano ukulele focuses on quality construction, great sound and easy playability. It’s a robust instrument best for beginners who are new to the ukulele. If you’re looking for an affordable ukulele, you’ll be hard pressed to find a better one in this price range. I know I keep describing Kala’s ukuleles as beautiful, but they really are a testament to the workmanship that Kala puts into each and every one of their instruments. The Kala Koa Concert Gloss ukulele (Kala KA-KCG) exemplifies this attention to detail. Made with Hawaiian Koa, the KA-KCG is a beautiful shade of reddish brown trimmed with maple and features accents in black and white. Kala gives the KA-KCG a novel slotted headstock adorned with a Mother of Pearl inlay. Additionally, the KA-KCG ukulele comes with premium D’Addario Titanium strings. These give the ukulele a very nice full sound without losing any of its bright quality. Kala first introduced the U-Bass in 2008. It was a revolutionary ukulele fitted with Kala’s proprietary Pahoehoe strings and designed to mimic the sound of an upright bass. An upright bass with the portability of a ukulele? Great Kala U-Bass reviews? Of course it became an instant hit. Since then, others have attempted to recreate their own version, but Kala will always be the pioneer of this type of instrument. 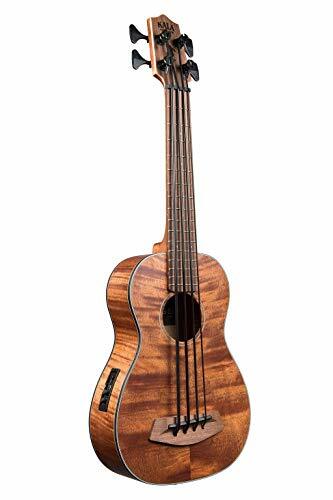 They released the Exotic Mahogany U-Bass in 2012, and it quickly became one of Kala’s bestsellers. Bassists may find it difficult to adjust to the narrower frets, but once you get used to it this thing is a blast to play! Kala is dedicated towards making the best instruments, and any instrument from them is a great choice. They hand select all their materials, and every ukulele they make must pass the Hawaiian test market before they are released to the rest of the world. This ensures that their ukuleles meet the high Hawaiian standards, which usually means a quality instrument and a greater likelihood for success in the global market. Whichever Kala ukulele you end up purchasing, I’m sure you’ll be happy with both the quality of the instrument and the quality of the sound. Hi Chris, I’m sorry to hear you had such a bad experience! That’s not typical of Kala. I hope they’re able to fix the problem. And no, they don’t send every single ukulele to Hawaii for quality control, but they do test new models on the Hawaiian market before releasing them to the general public. Oscar Schmidt and Cordoba are great uke makers! My personal favorite is Cordoba, I don’t think I’ve picked up one of their ukes that I haven’t liked!